It’s been some considerable time since I blogged and, boy, have I missed it! My absence hasn’t been because I’ve not been stamping or had nothing to share with you. Quite the opposite! I had a run of workshops which kept me very busy, but also life outside of stamping was demanding lots of my attention and energy. And the longer it got between blog posts, the harder it was to get back into it. BUT rather than proscrinate any longer (which I’m particularly good at), here I am back blogging. Yesterday I went to the Stampin’ Up Melbourne Regional training day and it was so incredibly inspiring. Soooo many great ideas that I’ll be trying out soon. Today’s card is the one I took as my swap to Regionals. Do they look familiar? No prizes for guessing that my swap was inspired by the cover of the ‘Popular Penguin’ novels. 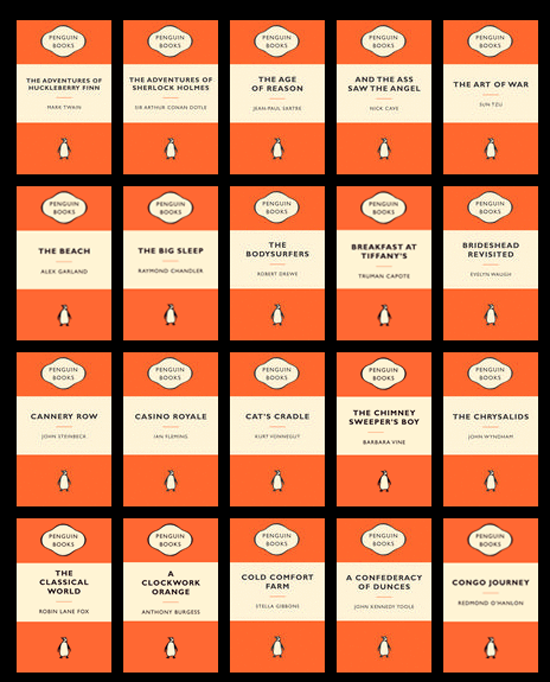 And although there’s no ‘penguin’ on my ‘book cover’ I think there’s enough of the iconic design of the cover to make it instantly recognisable. 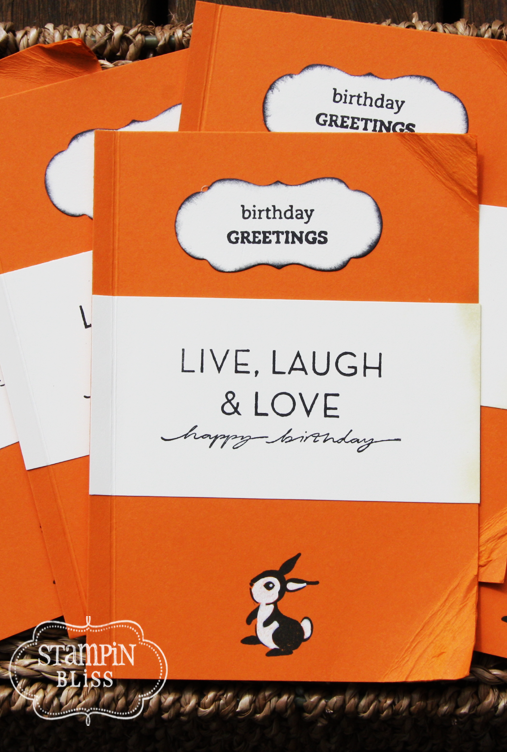 There’s nothing difficult about this card – in fact, it’s super easy! I scored an extra line with my bone folder to make it look like the card has a spine. The corners have been ‘dog eared’ and the edges of the Very Vanilla daubed with River Rock ink to make it look like a well loved book. The cute little rabbit stamp from the Forest Friends stamp set was my ‘penguin’ and I used the white gel pen to make it more like the logo you see on the books. I know what card I’ll be sending out to all my book-lover friends! All the products used to make these cards can be purchased through me. I suspect that the gorgeous new ‘Contempo Christmas’ stamp set and its coordinating ornament punch made it onto many of your wishlists. And I must say, this one’s a no-brainer! Anything that comes with a coordinating punch, triples its must-have value in my books. 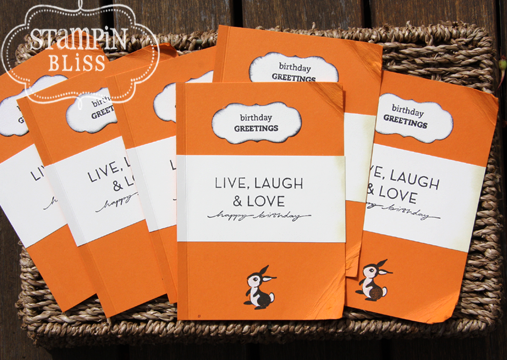 I made the little flip open gift tag (top left) by folding over my Very Vanilla cardstock. When I slide it into my ornament punch I positioned the fold of my cardstock at but not beyond the top so that when I punched it out, the fold was intact. I wouldn’t recommend it with anything thicker but it punches through two layers of Whisper White or Very Vanilla with no trouble at all. 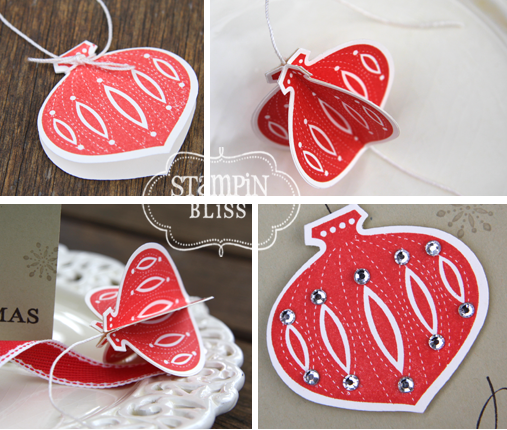 And how sparkly are the Stampin’ Up self-adhesive rhinestones! I know there are cheaper ones out there but truly, you get what you pay for and if you’re doing a special project, particularly if you’ve spent a squillion hours on a scrapbook page, then you’re going to want to use these babies! If it’s worth blinging up, make it good bling. 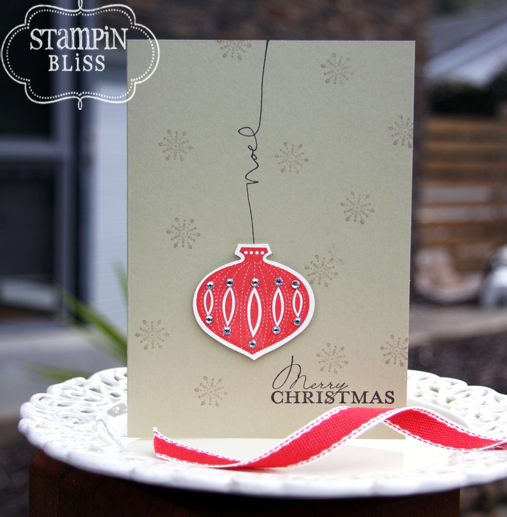 And here’s a super simple Christmas card! The cardstock is actually River Rock (although it looks more like Sahara Sand in the photo) and the inks are Early Espresso, Poppy Parade and Sahara Sand (only because I don’t have River Rock ink yet, otherwise I would have used that). I’ve punched out the bauble shape with my ornament punch and popped it up on dimensionals. Seriously, this card took all of 2 minutes! 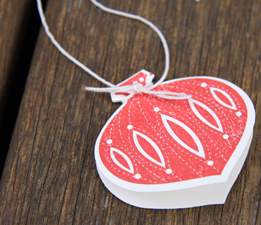 And how easy would it be to make gorgeous handstamped Christmas wrapping paper this year! All you need is a roll of white or kraft paper and stamp away! Great job for the kids (if you can trust them with your stuff!). The Contempo Christmas set contains four stamps and is very reasonably priced – just $26.95 for wood and $21.95 for the clear-mount set! The ornament punch is $33.95 so together that’s not a lot to pay considering it’ll take care of your Christmas cards, gift tags, Christmas wrapping paper and some Christmas decorations in one fell swoop! So if you want to take care of your Christmas business, send your order through and I get it processed. How would you like all these for FREE? adele on A popular rabbit! Chris on A popular rabbit! Leonie on A popular rabbit!